End Abuse offers a number of resources to advocates and the public to learn more about domestic abuse and the work being done across Wisconsin to end domestic abuse and oppression. Since 2000, End Domestic Abuse Wisconsin (WCADV) has been researching, documenting and publishing an annual report detailing domestic violence-related homicides in Wisconsin. In doing so, our intent is to honor the victims and survivors of domestic violence homicide. We also want to support Wisconsin communities to create opportunities for intervention and prevention of homicide. We hope to expand the understanding of the dynamics of domestic violence among Coordinated Community Response (CCR) Teams, Elder Abuse Interdisciplinary Teams, and other critical systems where those living with domestic violence, whether as the primary target of the violence or the perpetrator, might seek help, assistance, support and opportunities to change. Through our annual reporting, we hope to inspire community members to get involved in efforts to prevent domestic violence. This is the sixteenth edition of the Wisconsin Domestic Violence Homicide Report. End Domestic Abuse Wisconsin has been tracking and analyzing all incidents of domestic violence homicide that occurred in Wisconsin since 2000. This report documents fatalities from 2017. This is the fifteenth edition of the Wisconsin Domestic Violence Homicide Report. End Domestic Abuse Wisconsin has been tracking and analyzing all incidents of domestic violence homicide that occurred in Wisconsin since 2000. This report documents fatalities from 2016. This is the fourteenth edition of the Wisconsin Domestic Violence Homicide Report. End Domestic Abuse Wisconsin has been tracking and analyzing all incidents of domestic violence homicide that occurred in Wisconsin since 2000. This report documents fatalities from 2015. This is the thirteenth edition of the Wisconsin Domestic Violence Homicide Report. 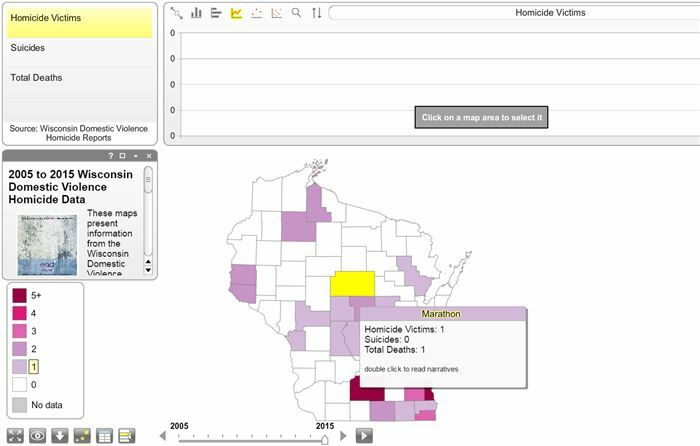 End Domestic Abuse Wisconsin has been tracking and analyzing all incidents of domestic violence homicide that occurred in Wisconsin since 2000. This report documents fatalities from 2014. The Report documents and analyzes all of the domestic violence homicide incidents that occurred in 2013 in Wisconsin. The 2013 report is significantly different than previous editions because, in addition to the descriptions of individual homicide incidents, it includes interviews and contributions from a diverse group of leaders and stakeholders, such as legislators, law enforcement officers, advocates and surviving family members. Continuing the work launched in 2000 with publication of the first Wisconsin Domestic Violence Homicide Report, this edition details domestic violence-related homicides in the calendar year 2009. This brief accounting in no way represents the victims’ full lives. Within the limitations of readily available public information, we have endeavored to construct as accurate a description as possible of key events and circumstances related to each homicide. This edition details domestic violence-related homicides in the calendar year 2008. This brief accounting in no way represents the victims’ full lives. That would require a far more detailed inquiry, in-depth study of official case records, and conversations with family and friends left behind. Within the limitations of readily available public information we have endeavored to construct as accurate a description as possible of key events and circumstances related to each homicide. This is the first edition of the Wisconsin Domestic Violence Homicide Report.